How does Customer Experience Management (CEM) define itself? We define CEM holistically, i.e. not only from the point of view of personalized web content in online marketing. It is about the consistent recording, controlling and optimization of all contact points of a customer to the company – online and offline, self-initiated or influenced by third parties. In order to introduce a CEM, you first need a system that allows you to evaluate your own brand from the customer’s point of view. The method of Customer Journey Mapping has proven its worth. From the point of view of Marketing Research, “customer journey” refers to all touchpoints of a consumer with a brand, product or service. This includes not only the direct interaction points of a customer relationship (ad, commercial, website, etc. ), but also the indirect contact points at which the opinion of third parties about a brand, a product or a service is obtained (rating portals, user forum, blog, etc.). Why customer management at all? Customers today have significantly more control over their purchasing process than ever before. At any point on the journey, the customer can decide to cancel and exit – for whatever reason. While the basic consumption process (information, validation, decision, use and retention) has not changed, the paths a customer takes between these stations have become unpredictable and marked by moments of truth. These are certain contacts or events that accelerate or slow down the passage through the stations. In addition, there are so-called “information distractions”, i.e. incidental information that attracts the customer’s attention and encourages him to switch to another path. In order to effectively counter this unpredictability, it is necessary to build a consistent set of customer experiences that guide and retain the customer or are simply fun, positively surprise or exceed expectations. Customer management therefore does not primarily mean processes – these are usually well documented – but experiencing these processes from the customer’s point of view. Planning, evaluating and proactively managing these “experiences” is hardly feasible without active customer management, not only for large companies, but also for medium-sized companies. The alternative lies in the hope that each individual action will already be carried out in the interests of the customer, or that the competitor will not act better in detail. No real alternative. Do we really know the customer’s view in all details? The customer, who uses services of your company or buys your products, has at least one, but mostly a multitude of contacts with different areas and employees, which influence his perception of your company. 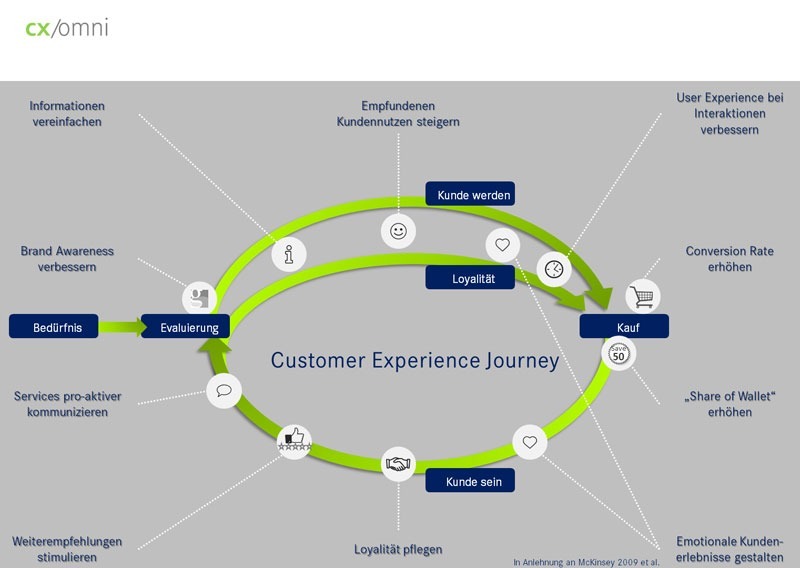 Making this “journey” (“customer journey”) of your customer through the company as pleasant and smooth as possible is an important aspect to build long-term customer relationships, to increase customer satisfaction and to achieve a natural customer loyalty. Customer Journey Mapping is a method of looking at one’s own processes from the customer’s point of view. It is used to close the “reality gap” in the perception between customer and company. Customer Journey Mapping makes it possible to capture, describe and track the experiences a customer has when using a service of their company – those central perceptions that then form to customer satisfaction. In contrast to the documentation of processes, the documentation of the customer journey not only depicts individual process steps, but these are supplemented by quantitative, qualitative and subjective findings. This includes all customer relationships from the first inquiry to complaint management. The resulting optimization measures put your company in a position to harmoniously adapt its own service portfolio to the needs of the customer and thus enable positive experiences that are geared to further increasing customer satisfaction – especially with the aim of emotional differentiation from your competitors. CEM should not be a one-off snapshot, but should serve the optimization of essential tasks in marketing, sales and service, supported by a sustainable system. It therefore also includes the aspects of the customer relationship which are summarized under the terms corporate identity, brand value analysis, market research, brand management or brand control. Customer management, customer experience management and Touchpoint Mapping ultimately have a pleasant destination: More turnover and enthusiastic customers.